Seldom do these kinds of hyped stories provide the kind of quantitative analysis that Bill Rees evidenced in his 2014 presentation, Why Degrowth? a small excerpt of which is posted below. In April 2014, The Extraenvironmentalist hosted an event in Vancouver, BC in partnership with Degrowth Vancouver to ask the question of ‘Why Degrowth?’ The speakers were William Rees and Jennie Moore. Their videos plus a Q&A session from the event are posted on the Extraenvironmentalist’s website, accessible by clicking on the linked title below. The short post below is excerpted from my transcript of Rees’ full 35-minute video. For any who want to watch the videos, click on the following linked title. The excerpted transcript selections below appear in Ree’s video at about the 26:27-minutes mark, followed by a second excerpt beginning at the 29:34-minute mark. In a future post, I intend to present my full transcript of Bill’s video presentation, Why Degrowth? along with an embedded version of the video. Most authorities come up with curves like this when talking about the energy future. This is going out to 2030, by which point, by the way, western countries should be down to about 50 to 70% reductions in fossil fuel use. But what everybody’s expecting is that we will have increased [growth in fossil fuel extraction] continuously through that whole period. Despite everything you hear about solar and wind power making huge gains in the markets in this country or that country or some other place, the reality is that, in the aggregate – excluding hydro for the time being – in the aggregate, alternative and renewable energies, about two and a half percent of the global energy budget [are] scheduled to [rise to] maybe 5 or 6% by 2030, as the fossil fuels continue to increase. Hydro will play about an equivalent part. So, only 12% will be truly renewable energy if we stay on the business as usual track. So renewables, including hydro reach 6% of market share by 2030, up from 2% a couple of years ago. So there’s no hope if that’s the trending for true alternatives. Any practical substitute for petroleum in key uses must be cheap, abundant, increasingly affordable, transformable into a liquid fuel similar to oil and non-polluting. Most are not. They produce electricity. Most of our activities don’t involve electricity. Electricity is 18% of our energy budget, the rest is fossil fuel. Any form of renewable energy that cannot economically both produce itself and supply a surplus adequate to run the economy is not a viable alternative to petroleum. In other words, produce all the equipment needed to produce that renewable energy, plus provide the surplus necessary to run society. And when you put it all together today we just passed the point where all the renewable energies in the aggregate are barely producing enough energy to produce the equipment that are used to produce that energy. There’s no surplus to keep the rest of society going. So far, none qualifies and renewable energy in total cannot yet replace fossil energy. So in the aggregate, we’re not anywhere near the point where we can think of replacing fossil fuels. 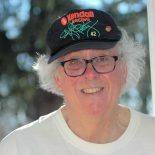 William Rees is a human ecologist, ecological economist, Professor Emeritus and former Director of the University of British Columbia’s School of Community and Regional Planning in Vancouver, Canada, where his research and teaching focused on the biophysical prerequisites for sustainability in an era of accelerating ecological change. Dr. Rees is co-originator of ecological footprint analysis & winner of the 2012 Blue Planet Prize and the 2012 Kenneth E. Boulding. This entry was posted on December 27, 2015 by fjwhite in evidence based counterpower, political action, scientist's counterpower, sustainability and tagged fossil fuels, renewable energy, William Rees.